Robo en la noche…..third time is a charm! This is the third time that my fabulous colleague, Megan Matthews, and I are teaching Robo en la noche by Kristy Placido. The first time was two years ago and we rushed through it in the final weeks of school, relying heavily on the terrific resources from Cynthia Hitz. The second time was last year and the rhythm of teaching was disrupted multiple times by many snow days and the intrusion of PARCC testing that disrupted our schedules for weeks. This year, the third time, we have only had two snow days, and the book is flowing very well. We have continued to add resources to the novel as we ourselves expand our knowledge of TPRS and CI techniques to complement some traditional methods. Previously, I have blogged twice about Robo, see here and here. Since it is a snowy President’s Day here in Maryland (and I should be grading papers! ), I decided to post some of these new resources that might be of interest to others who are using Robo en la noche, also. We are going to be starting chapter 9 this week. Chapter 2: Chap 2 picture sort and group presentation With this activity, I gave every student a laminated card (took the luxury of printing them in color! ), and they had to decide how to group themselves. The tentative categories were Makenna, Margarita, Costa Rica, Cecilio, etc. My Spanish III classes have between 24 – 28 students, so I needed a lot of pictures! Once they decided their own groups, they worked together to create a presentation about their category. I gave them about 4 minutes, and they shared it with the class, using their pictures to illustrate what they were saying. I think that in the future I might follow that with having each group write an individual summary of their presentation. Note: Some of the pictures could fit into more than one category, it was up to the student to decide where to go. Prior to their group presentations, I had the class assess whether the pictures were in the correct grouping, and they were allowed to change, if necessary. Our final repetition used this “Toca” board. ch 3 toca vocabulary Working with a partner, students first identified the meaning of all of the structures. Then, each working with a different colored dry erase marker (the boards were laminated), I said one of the structures in English. The first to highlight the correct structure scored the point. We wiped the board clean and repeated this several times. By the time we actually read the chapter, all of these structures were easily understood by the students. There was absolutely no stumbling! Chapter 5: Review bird with all characters Working with a partner and different colored dry erase markers, students selected a character and said one sentence about that character, coloring through the character that they selected. Since the characters are within the bird multiple times, they were able to say many facts about each character without repeating. This activity lasted about 5 minutes; when they were done, they held up their birds (now colorfully illustrated), and, just for fun, we selected the “prettiest” bird. Chapters 5-6 Chapters 5 – 6 pictures for oral assessment smaller version I tried some variations with these picture cards (to be printed in color and laminated). The pictures can just be shown to the class, with the entire class adding descriptions to each picture. The pictures can be given one at a time to a group of 2 – 3 students, who describe the picture with as much detail as possible, and then pass the picture to another group. Or, using an idea from Carrie Toth, called the yellow brick road, I took the students into the hallway, made a “pathway (yellow brick road)” with the pictures and they worked (in partners) their way through each picture. I allowed about a minute with each picture before asking them to move one picture to their right/left. It was relatively easy for me to circulate and listen to their conversations to give them an informal speaking assessment. Chapter 7 Capítulo 7 Robo en la noche predict the chapter Prior to reading chapter 7 and working with a partner, students identified each picture and then selected which pictures they thought would represent what would happen in Chapter 7. They put an X on the pictures that they thought would not represent action in the chapter. After deciding, they turned the paper over and wrote 5 sentences about what they expected would happen in the chapter and then presented them to the class. Their ideas were certainly interesting!! After reading the chapter, we checked the papers/predictions again. I hope that something in this post may be useful to someone else. If you are using this book, I would love to hear some of your ideas. Songs continue to be one of my favorite authentic resources to introduce, reinforce or enhance a grammatical concept. While this post is about a song that I used for work with the present subjunctive, the actual activities are applicable across the spectrum. My three Spanish IV classes are about 8 days into intense work with the present indicative and present subjunctive. We have used many songs: Quizas( Enrique Iglesias), De Todo el Mundo (Enrique Bunbury), Azul (Natalia Lafourcade), La llave de mi corazon (Juan Lulis Guerra), Mi Princesa (Victor Cruz), and Inevitable (Samo). We have used authentic “clippings” from current events, exercises of rote practice, lots of picture prompts of incredible, bizarre or interesting situations, and even more speaking/listening prompts. Up next: another song, this time, Exigimos (We demand) by Doctor Krapula (from Colombia). Exigimos was the song that was playing in class on Tuesday when the students were entering. I had also used it as “background” music while working on other activities last week. After the bell rang, we took a preliminary look at the lyrics for Exigimos and then quickly moved to something else. 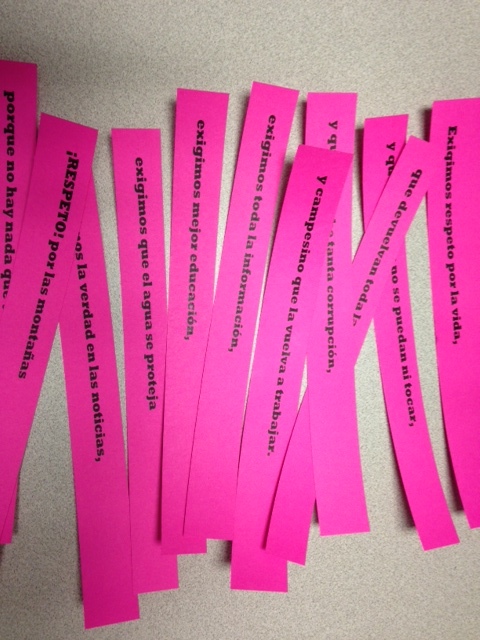 On Wednesday, I placed the students in groups of two and gave each group sentence strips (in vibrant colors) for the first verse of the song. They listened one time to the verse, putting the strips in the correct order. Next, they quickly discussed the meanings of the lyrics, identified the subjunctive verbs and the reason for the subjunctive verbs, and also the infinitive for each verb. I then gave them verse two with 12 verbs on separate pieces of paper. The first thing that they did was divide the verbs into two columns: present indicative and present subjunctive. Again they quickly determined the meaning of the verbs. I then had them orally change the subjunctive to indicative and vice versa. I then played the second verse of the song (two times) and they placed the verbs in the correct places on the paper. Once again, they determined what the second verse was singing and the reasons for the subjunctive verbs. 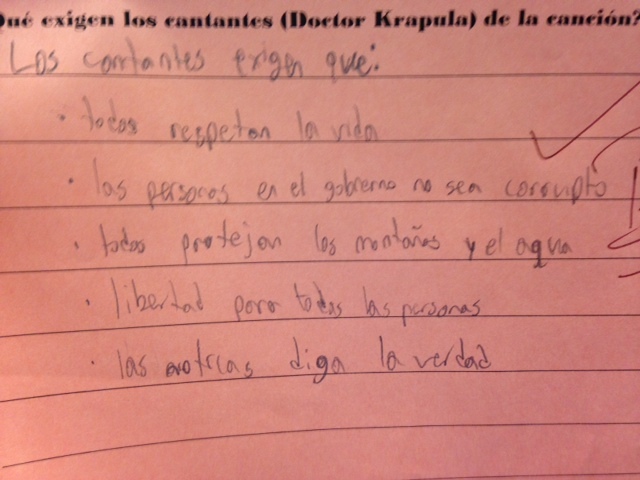 As a class, we had a discussion about why the group would be singing about “demands” for Colombia. I taught about two thirds of these students in Spanish III, so they had a good background for discussion based on a big unit we did on Colombia in Spanish III. The third part of working with this song involved the spoken part of Exigimos. The students definitely struggled with the first two lines in this part, so I had them determine for everything else first. As a class, we then worked with those first two lines. Individually, they completed the four questions based on this section. The last part of this marathon with the song was a Free Write that was completed as the song was playing again. 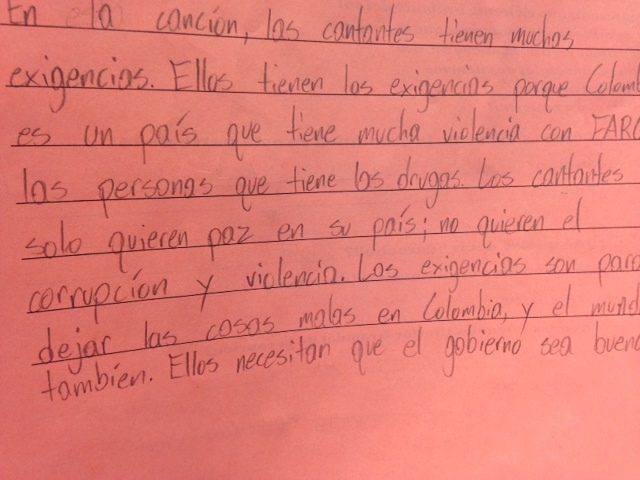 Prior to beginning the Free Write, I told them that I expected to see subjunctive in their writing…that they could “bullet” items if they wanted to do that, but that subjunctive had to play a role in their writing. When the song was finished, they exchanged papers and had a peer read it, with the option of circling the subjunctive verbs they saw. I gave them an additional moment to correct or add anything. Finally, they completed a shorter Free Write (about 3 minutes) on the reverse side. This dealt with applying cultural knowledge to the song. 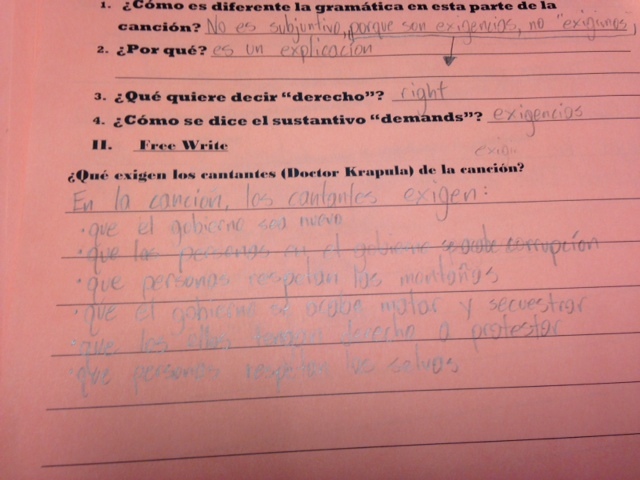 I collected the paper and scored it for content (15 points) as well as subjunctive use (5 points). As a whole, almost every student scored well with the content assessment, and I was pleased with what they knew and were able to say. The use of the subjunctive was more uneven, with students who did really well, and others who did not. Below are some of their responses. There will be another part of this lesson tomorrow as I will ask students (in small groups) to come up with a list of “demands” that they could create as students in our school. I will then ask them individually to write seven demands: Exigo que…..
Educreations, a great program for iPads and world languages! Given the opportunity to “borrow” 12 iPads this past week, I experimented with a program called Educreations. The results were pretty fantastic, and I can’t wait until I am able to have the iPads again! My Spanish III students are approaching the end of a clothing unit, a pretty standard unit. 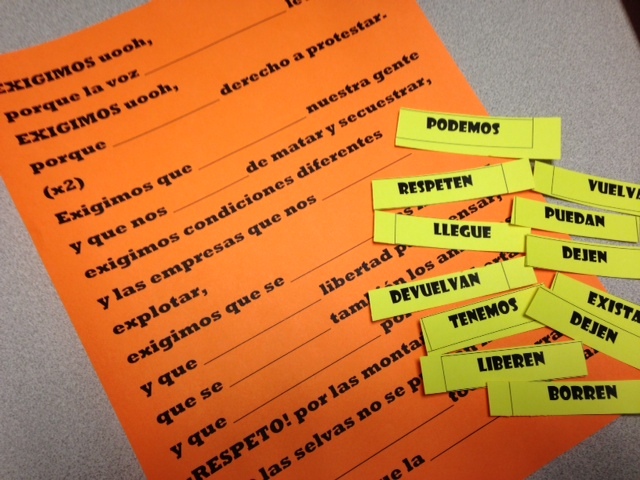 In my district, students study the basic vocabulary in Spanish II, and then get a reinforcing unit in Spanish III. We add words such as tight, loose, striped, plaid, polka dot, vest, slippers, cleats, bows, belt, scarves, etc.or vocabulary that is beyond the basic pants, shirt, shoes. At the same time, I’m attempting to “sneak in” some imperfect tense verbs for the first time without making a big deal out of it. Traditionally, the performance based assessment for this unit has been an impromptu conversation with partners based on a shopping expedition. Students have practiced with various partners prior to the actual assessment, and then receive the prompt, randomly, from ones that they have practiced, on the day of actual assessment. I was looking for a more relevant, authentic way to assess learning, and discovered Educreations, a FREE program! With Educreations all student work, once they have enrolled in your course via your private code, gets sent directly to your computer, making grading the projects relatively easy….no paper involved! With the iPads, students are able to take pictures and upload them, draw pictures on the iPad or upload images from the internet. They also are able to write or type text on or around their pictures. The final step is recording their voices. This last step is mandatory, as the project can not be saved until the student has recorded. As far as technology projects go, this one went very smoothly. There were a few bumps in the road: background noise is always a problem when recording individuals in large classes (there were 26 – 29 students working in each class), but all of the recordings make the recording student very audible. The biggest problem was discovering that if they wanted to delete their recording on one page and re-record, they could not change the order of the recordings on their pictures, meaning that the recording then did not match the appropriate page. And, of course, we could have benefited from more than 12 iPads (the number that my county had available to loan). Also, I would love to see an app for Educreations for Smart phones. I allowed 2 days for this project: one day for the students to familiarize themselves with the features of Educreations, and to practice, and day two for the actual assessment. On the first day, students were directed to create a page using a picture they took, a page with an image from the internet, and a page that they drew. They wrote/typed on all pages and recorded on all pages. They were directed to include at least 4 articles of clothing on each page, 4 descriptors and they had to use verbs (present or past). I informally assessed their work based on the fact that they completed the majority of the assignment. On the second day, the day of formal assessment, I eliminated the internet image search because it just took too much time for some of them to find what they wanted. Instead, I had posted large color pictures of entire outfits (34 of them), many with celebrities (Big Papi, One Direction, Taylor Swift, Ray Rice, Luke Bryan, Romeo Santos, etc) around the room so that they could take that picture with their iPad. On the second day, they focused on taking two pictures (of themselves or the posted pictures) or one picture and one drawing. The parameters of at least 4 articles of clothing, 4 descriptors and verbs remained, with the recording on all pages shared by the students involved. I also gave them an example of what I expected. I am not exaggerating when I say that all of my students were actively engaged in this project. There were no “slackers”. Most of them thoroughly enjoyed working on the project and have asked when they get to use the program again. The excitement and interest was real, and I wish that a supervisor had been officially observing! Having started the “sports/Spain” chapter with Spanish III, and having added lots of material related to jai-alai, la corrida de toros y la geografía de España in the last two years, I decided to expand the part on fútbol this year. Actually, I was inspired by Kara Jacobs and her mini unit on El Fútbol y la Copa Mundial. In 2010, 2011 and 2012, I spent some time at the beginning of the school year with the songs Wavin’ Flag, Waka Waka and Grito Mundial. I didn’t do that this year, so it seems logical to pick up something in the sports unit related to fútbol. Today we spent just a bit of time with the song No hay dos sin tres (David Bisbal/Cali y el Dandee) and we talked a bit about the success of Spain in the recent years with fútbol. Waka Waka will be playing as the students walk into class (it is routine that there is music playing as they walk in), and I may spend a minute or two talking about what they see/understand. However, the lesson is going to be wrapped around Wavin’ Flag (David Bisbal and K’Naan). 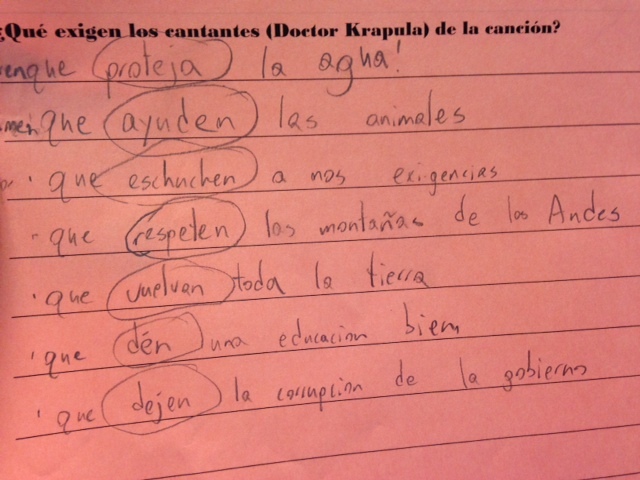 Working with a partner, students will be given the Spanish lyrics to the song (without identifying what the song is). Each group of two students will have two different colored highlighters to highlight first the nouns, then the verbs. After a brief check to verify responses, the second step of this activity will be to place the nouns in three categories (people, places, things) and to place the verbs in a fourth column. Hopefully, this will help them to give more context to the lyrics of the song. I will spend just a few minutes with the verbs, asking them to look at tenses. They have not worked with the future tense, so it will be interesting to see what they do with the verb seremos. It will just be a glancing look….oh….future…do you recognize the infinitive….how do you think the future tense may be formed? Next, I will give them two sets of sentence strips. I’m going to use two different colors to separate the first two verses from the final two verses so that they are not overwhelmed by 15 strips of paper. With their partner, as they listen to the song, they are going to attempt to put the lyrics in order. However, the lyric strips that I will have given them are not in Spanish: they are loose translations in English. I will have them attempt to do this without looking at the Spanish lyrics; they will be able to check their order with the Spanish lyrics after listening. Embedded in this activity will be some vocabulary review, coming from recent units: fé, verdad, países, unir, fuertes, pueblo (as a people), vida, fuego as well as new vocabulary: campeones, comenzar, intentar.Of course, the last step to this activity is going to be to sing the song! Materials can be found here: Wavin Flag activity.